Midway through his speech Wednesday at Camp Pendleton, Calif., President Obama shifted from talking about military policy to highlight the sacrifice of a Marine wounded warrior and his wife, both of whom continue to serve in the Marine Corps. Capts. Matthew and Camille Lampert, were asked to stand after Obama briefly described their last few years. Lampert was a special operator in Afghanistan when an improvised explosive device took both of his legs, Obama said. He survived that 2010 attack, and set out on a grueling recovery so he could get back to his team. Lampert and his company are now preparing for their next deployment, to the Pacific, Obama said. His wife, meanwhile, is working to become a test pilot “because, Matt says, she likes to ‘fly aggressively,'” Obama said. Lampert says in the video that the night he was wounded, he and several of his Marines moved across a bridge in Afghanistan with a couple of Afghan commandos. They entered a compound they were examining through a courtyard wall. Lampert credits now-retired Maj. Gen. Paul Lefebvre, the commanding general of MARSOC at the time of his injuries, with asking him to become a company executive officer and return to Afghanistan. Captain, You make me even more proud that I served as a combat Platoon Sgt Marine in Vietnam 1967 & 1968. All the best to you and your wife, Sir Semper Fi, brother! There is no way I would have shaken Obama’s hand. This man is a pretender and any kindness he shows to individuals in the military is overshadowed by his hatred of America and his systematic dismantling of our armed forces. BTW, I too am a combat veteran Marine Infantry NCO. To all of those who will eventually get on here and say “Whatever, of course you would!” You really don’t know me. I would be respectful of his office but say “No I will not shake your hand sir.” And there is nothing in the UCMJ that requires me to. It is time we really and honestly let this man know that we do no respect HIM. He needs to go before all is lost. Thank you Capt. Lampert for your sacrifices. OORAH! Semper Fi! Thank you for your service. God bless you and keep you. God bless the Corps! Capts Lambert, congratulations! It was an honor to meet you at the USMC Ball and I’m amazed at your accomplishments. I help support the Ride430 raising funds for MARSOC. 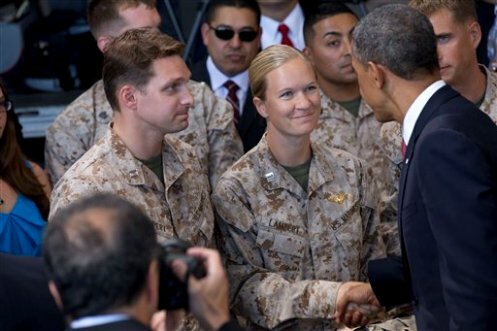 The fact that the President shook your hands shows his respect for you and what you both have done, and sacrificed, for your country and fellow Marines. As a 6 year USMC combat veteran, First Force Recon Company, Vietnam era, when I was a Marine my boss was the Commander in Chief, President of the United States. As such, he would get the utmost respect and support from me and my fellow Force Recon Marines. Sgt USMC 1960-66. I was very glad President Obama honored and introduced you to many that don’t know your struggle. God Bless you. I only pray if my son sustains that type of injury he can be as driven and focused. This was my Co in LAR. I have to say this man was a great marine as u can see. Thank u Captian Lampert for every thing u did for Company A.
Capt. Lampert, Thank You for your most dedicated service! You are a true American Hero!!! THAT is heroism, deserving of the oft-overused word. Inspiring story. For those here focusing on things other than the two captains, feel free to reassess the real point of this story, and avoid being selfish by opining in a more appropriate forum. So many amazing things we could say about this couple and their sacrifice and yet so many decide to use this as a platform for politics. No one wants to hear your crap, particularly the one comment that was racist. Inappropriate and sad on a story that was so uplifting. A short story; Capt. Lampert was Regimental Commander when I was a new cadet at Culver. The first time I had guard duty I had to stay in the guard shack through the breakfast hour. I was not expecting to eat until lunch. I was surprised when the regimental commander brought me breakfast with extra bacon. He had to carry the tray carefully across campus lest he spill all my little glasses of milk. -A deed that was in startling contrast to his high-speed attitude and rank. It was a lesson in servant-leadership that made a deep impression on young mind. Now that I hear he lost both his legs and is going back to war I’m not at all surprised. That Marines is what we should have all striven to become, Capt Lampert should be used as an example in Boot Camp as in what it takes and what sacrifice truly is to become a U.S Marine..
As with all things we have two sides “as it should be”.. Even in our Marine Corps we have those who wear and have worn the eagle, globe and anchor..and still don’t know what Semper Fidelis Means and should be called exactly what they are Paper Marines…based on some of the comments on here it is true ..sadly…. Semper Fi Brothers and Sisters. Awesome man. Your perseverance makes me proud to be an American. Thank you for your uncompromising dedication to you fellow men and country. God Bless You! Be Safe!